I've been trying to do some work on Mystery Project X every day. And nearly every day I hit some problem on which I bang and bang and bang and bang and eventually pound through. I've heard it said that if it's not hard, you're not stretching yourself enough. I'm stretched. The problem usually isn't drawing, it's storytelling--controlling the pace of the story through the panels and deciding what information needs to be in each panel to not only depict that moment of action but pay off the previous one and set up the next. I could write a really long post on this topic someday. Not today. But here's a fundamental truth about making comics I didn't understand when I was young: a lot of people can draw one pretty picture that'll take your breath away. Literally millions of artists can draw prettier, more impressive pictures than I can. The trick--what makes what I'm trying to do comics rather than illustration--is drawing the pictures before and after that one to convey information, create a mood, evoke an emotion. The choices you make define your voice. They can't all be technical showstoppers, any more than every violin recital can be "Flight of the Bumblebee." Sometimes the very best comics panel is one that shows very little. Sometimes the most perfect thing you can draw is nothing at all. "Paperman" won the Oscar for Best Animated Short Film at last Sunday's Academy Awards. I watched it for the first time this morning. Really charming and nicely done, I think, and worth 6:35 of your day. When the film won its Oscar and director John Kahrs went on-stage to accept, producer Kristina Reed tossed a few paper airplanes from the balcony. Security converged and kicked her out--for 10 minutes, until I guess someone explained the situation. Then she got back in. That sounds like a cute story, too. 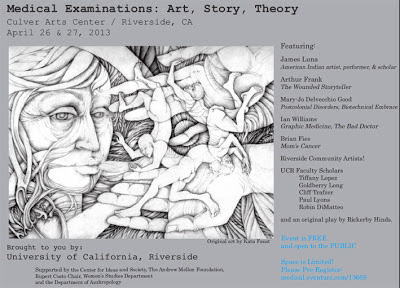 This is a fine time to announce my participation in a conference titled "Medical Examinations: Art, Story, Theory" at the University of California Riverside on April 26-27, 2013. This opportunity emerged from my involvement in the Graphic Medicine conferences, which is where I met Juliet McMullin from UC Riverside's Anthropology Dept., who invited me to come on down. This looks unique and interesting. Although it shares some roots with the Graphic Medicine conferences I've known and loved, this is more of an artistic community event than an academic meeting. According to its website, it will "feature major scholars whose approaches to medical narratives vary and bring them into conversation with one another. The focus of this conference on the 'neoliberal body' aims at centering our discussions on the kinds of medical narratives that emerged in advanced capitalism, high-tech medicine, and new media while health disparities among different populations remain." Very attractive to me personally is that another of the speakers will be my friend Ian Williams, the UK physician and cartoonist who organized the first Graphic Medicine conference in London a few years ago. I look forward to buying him a pint of something. 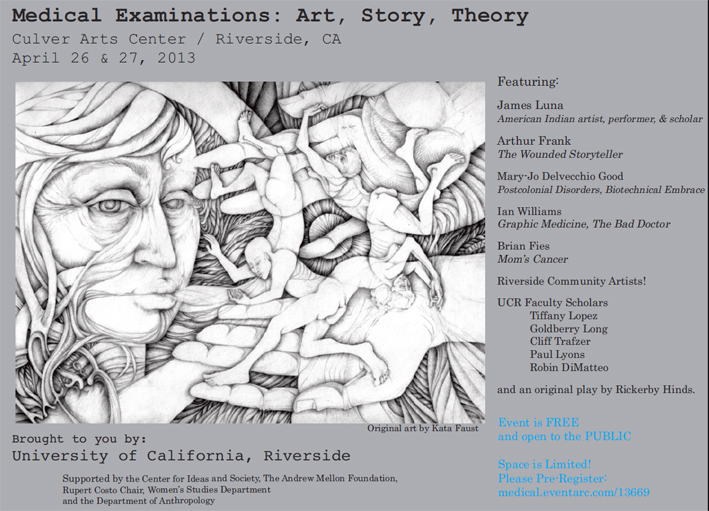 Very attractive to everyone else is that "Medical Examinations: Art, Story, Theory" is open to the public and free! Wow! The organizers are asking folks to register because space is limited and they need a head-count. UC Riverside is about 50 miles due east of Los Angeles. If you're in the neighborhood the last Friday and Saturday of April drop by and say howdy. I'm speaking Friday afternoon but plan to hang out for the whole thing. A week ago an evil-doer helped himself to a fair portion of Karen's and my life savings. I won't say how, partly because I'm not sure and also because I don't want to give anyone any ideas. Let's just say it involved computers. It's hard to describe the sinking feeling of looking at a monitor and realizing you have much less money than you thought you did the day before. It actually kind of reminded me of Karen's reaction when our car was stolen: "Did you take it? Because I didn't take it. Seriously, did you take it?" Luckily, our giant multinational mega-banking institution has been completely helpful and supportive--in fact, they alerted us to the problem in the first place. We couldn't have asked for better, more professional service. After a brief investigation that I assume convinced them we were victims rather than perps, we're getting our money back. All relevant computers are now cleaner than a CDC Ebola lab. But what a hassle! New everything: checking, savings, credit, debit. It's all just electrons, and oh so fragile. Where was George Bailey when I needed him? Families have in-jokes. Something Mom or Dad always says in a particular situation; a remark no one else would catch but the parents and kids look at each other knowingly. They're not always funny. In fact, sometimes they're groan-inducing. But everyone would miss them if they stopped. Many of my favorites are borrowed from pop culture and films. For example, I can't leave our car in a multi-story parking garage without saying, "Everybody remember where we parked." The twist on one of the best lines from one of the best Star Trek movies is that it was itself a riff on the cliched command of families everywhere. That's why it was funny: it's one thing when Dad says it at the mall, quite another when Captain Kirk says it to his crew as they debark from an invisible spaceship. The fact that I've re-repurposed it to again apply to Dad in a parking lot is deeply meta, man. Bonus points to this movie for "double-dumbass on you," which I don't use as often as I'd like. Also for "nuclear wessels" because one of my daughters works where they used to keep them. "Important safety tip. Thanks, Egon." From Ghostbusters, this applies in real life both when advice is unnecessary ("look before you cross the street") and when it's woefully inadequate ("in case of major earthquake, avoid falling debris"). "Have fun storming the castle!" from The Princess Bride. Applies to the start of any endeavour, but best for one involving some distance or difficulty. This got used a lot when sending the daughters back to college after a break. Most effective when my wife and I hug and wave like Billy Crystal and Carol Kane. "Not anymore." From The Pink Panther Strikes Again, best pronounced with an outrageous French accent. Applies to any situation in which something has been botched or destroyed, and someone utters a sentence that begins, "But that's . . ."
What're yours? Or is it just us? It's just us, isn't it . . . It's been a while since I've posted a bloated, self-important manifesto about process, so I thought I'd write one. This one stems from recent conversations I've had with a group of medical students as well as another cartoonist that boiled down to (as most conversations with other cartoonists boil down to): "How do you do it?" In fact, I've done it different ways. Mom's Cancer was done parallel with real time but several weeks behind. That is, I'd notice something that might be worth writing about, capture it in a note or sketch, then set it aside for a while to see if and how it fit into the rest of the story. I wanted Mom's Cancer to be more than a diary comic--I wanted it to have some real dramatic arcs and a beginning, middle and end, even if I didn't know at the time what the end was going to be. The result was a sort of guided spontaneity. In contrast, Whatever Happened to the World of Tomorrow was pretty solidly scripted from the start (although my initial proposal for WHTTWOT was very different--for example, there were no Pop and Buddy at all). Then I sat down and drew what I'd written. I still had a lot of freedom to revise as I worked, and Editor Charlie and I wrestled with the final chapter until quite late in the process. If there's a typical method of doing a graphic novel, I think that's close: script it then draw it. My first aborted stab at Mystery Project X went the same way. I wrote the whole thing, thought I had it nailed down, then started drawing. In contrast to WHTTWOT, which I pencilled and inked in four- or five-page batches, I decided to pencil all of Mystery Project X first, then go back and ink it all. I was trying to avoid a couple of problems. First, character designs can evolve and wander off-model, so that the character you draw on Page 100 looks nothing like the same character you drew on Page 1. You see this in most comics strips that run for decades: Snoopy in 1955 looked different from Snoopy in 1995. I faced this issue on Mom's Cancer, especially in how I drew my Mom, such that when we did the print version I had to redraw her for about the first third of the story (as described in this old blog post). So my reasoning was: draw the whole story in pencil first and work out the kinks so that when I inked the characters they'd stay consistent throughout. Second, I thought that pencilling the whole thing first might expose any weaknesses in my story or storytelling sooner rather than later. And I guess I kind of accomplished that, though not exactly as I'd intended, when I decided after 110 pages that I just wasn't liking either the process or the story and needed to start over. Now that I've restarted Mystery Project X, I'm trying to combine two processes that worked for me before. I know the outline of the plot but haven't scripted the entire thing. I'm working in chunks a few pages at a time: scripting, thumbnailing (sketching), pencilling and inking as I go. So far I'm finding it much more satisfying than my first stab at scripting the whole thing, then penciling the whole thing, then inking the whole thing. I think I know why. In my first go-round, I never had the satisfaction of getting something done. I pencilled 110 pages but they were only half done, and wouldn't be fully done until they got inked months later. Nothing was ever finished. My internal clock was out of synch. However, this time around I've gotten several pages pencilled and inked and done, and can tick them off my mental progress bar. Much more satisfying. I'm also enjoying the diversity of problem-solving required. One moment it's a story puzzle, next a scripting puzzle, then a layout, pencilling or inking puzzle. I find this much more stimulating than solving all the story puzzles, then all the scripting puzzles, etc. Variety is good. Finally, sort-of-making-it-up-as-I-go gives me some latitude to change the story as I create it. I have had the quintessential writer's experience of my characters deciding for themselves what they want to do despite my wishes, and enjoy leaving open the possibility it could happen again. Room to discover. In fact, I'm not really sure how the story is going to end. I know a couple different ways it could end, but I trust the characters will inform me how it must end by the time I get there. We'll see how it goes. It's worth adding that my processes cover a narrow range of the processes available. I'd say I edge toward the "stodgy" end of the scale. Other cartoonists create with an instinct and spontaneity that astonishes me. They just start drawing and see what comes out. I don't know how they do it but the results can be terrific. I believe Carol Tyler, whom I adore, works like that. Phoebe Gloeckner told me a story about a publisher who offered her a book contract but wondered, not unreasonably, what the book might be about. Phoebe couldn't say; she wouldn't know until she finished. Offer withdrawn. Finally, to learn way more than 99% of you would ever care to know about process, check out this post by cartoonist and comics instructor Jessica Abel, in which she describes a method of "visual scripting" she adapted from something Alison Bechdel does. I'm not sold on this but it's interesting. What I like about it is that it combines text and visuals, as opposed to methods that treat words and pictures as entirely separate entities. In the best comics, words and pictures need and support each other, and visual scripting encourages that. I'm less fond of the sittin'-at-the-computer-using-InDesign aspect, when it seems to me I achieve pretty much the same benefit doodling on a Post-It note. Still: worth a look. Food for thought. My bottom line: If you want to make comics, make them however works for you. There's no right or wrong way (though there may be ways that make your comics easier or harder to publish, which might be worth knowing ahead of time). If you're frustrated or stuck, maybe it's not your story or talent that's the problem. Give your process a jiggle and see what shakes loose. I have a very clear memory, and no evidence to support it, of seeing a long-ago interview with Angela Lansbury in which she was asked her advice for young actors trying to make it in Hollywood. As I remember it, the interviewer obviously expected the usual "winners never quit and quitters never win" inspirational pap, and seemed surprised when Lansbury said something to the effect of: try it for a while and, if you're not making progress, give up. She'd seen too many smart, talented kids waste decades of their lives miserably banging their heads against brick walls that were never going to budge. Go home, act in local theater if you want, but find something else that'll pay you money and make you happy. She concluded (again, as I remember it), "Settling is underrated." The question haunts anyone with creative ambition: persevere or give up? How many manuscripts do you submit, how many auditions do you go on, how many portfolios reviews do you do, before deciding it ain't gonna happen? The problem with all the stories that successful people tell of the big break they got on their very last try is selection bias: nobody ever interviews all the losers who tried ten or a hundred times as hard and never ever got their break. A deeper question nags as well: how can you really tell if you're good enough? I've touched on these questions before and revisit them inspired by some recent Internet chatter. First up is a post by First Second Editor Calista Brill provocatively titled "When to Give Up." "Not everybody is publishable, and not everybody has the necessary combination of talent, work ethic, and will-power to make a career in comics happen," Brill wrote. "Or: you might have all those qualities, but not in comics . . . to put it frankly, it can be hard to tell if you’re bravely persevering in the face of others’ unfair discouragement of your art, or foolishly persevering in the face of others’ accurate assessment of your limited talents." I thought Brill's piece offered honest and rational insight into the publishing business. A small Web firestorm disagreed. "How dare she crush anyone's spirit, don't ever let anybody kill your dream!" was the gist of it. You'd think she'd advocated puppy boiling. "A good sign that you should give up on an artform you’re passionate about is if a publisher suggested you do so and you listened," replied cartoonist Dustin Harbin. Well, yeah, I think it goes without saying that one person's opinion isn't dispositive, and in fact in the same post Brill says she never outright tells anyone to get out of the business (although she does advise some to have a back-up plan). But does empty rah-rah encouragement really do anyone any favors? Could it be an act of mercy to take someone aside and quietly tell them, "you know, I just don't think this is going to work for you?" Before you answer, picture all the deluded wretches who try out for "American Idol," can't sing a note, think they're great, and won't take "no" for an answer. Because winners never quit and quitters never win. Now picture all those wretches harboring a novel, screenplay, poetry collection, or comic strip in their bottom drawers. Brill sees them all. I know one guy who keeps showing me his portfolio, and the guy's got to be over fifty, and he's no good and I doubt he'll ever get work, but he's still trying because it's what he wants to do. And it's sad for him that he's not going to make it, but that's the way it goes. No rules, no map, no guarantees. You might not make it. My thanks to Mr. Busiek for reminding me, much as my mirror does every morning, that fifty is over the hill. He makes a valid point, though. If his Portfolio Guy is a typical comic book wannabe who started applying in his teens, he's probably been trying to break in for thirty or thirty-five years, wasting time and talent that might have been well-used otherwise. My pal cartoonist Dave Roman wrote a thoughtful and constructive response to Brill's post (scroll down the linked page to read it). "If we’re honest, often our lack of success is because we’re just not ready for prime time," Dave wrote. "Most cartoonists prefer to dive in first and learn our craft as we go. But what if other people don’t see our dreams the same way we do? How long do we tread water, believing in a dream if nothing ever seems to change?" His answer: "Before you give up . . . you may want to try changing it up." He tells of his own experience working very hard on projects that didn't seem to go anywhere or lead to anything, then finding a different path following the comics he made for fun while he was agonizing over the "serious" ones he thought would be his career. The fun ones have taken off. "It might be time to try a new dream that better reflects our current abilities. Put aside the old ideas (even if just temporarily) and switch gears. Break out of our box. Shake it up. Switch genres or art styles. Kill your darlings. See how it feels to face the unknown of a fresh canvas." "Terrible Artist Thinks Latest Piece Really Represents A Culmination Of Everything He’s Been Working Toward All His Life"
The more I see of it, the more I'm convinced that trying to build a creative career is very Darwinian. For every person making a living as a writer, artist, actor, singer, musician, dancer, there are a thousand or more trying to do the same. Competition is fierce, and success or failure often have nothing to do with the quality of one's work. On the other hand, my pal Mike Lynch took a leap of faith and quit his day job to become a cartoonist, figuring it would never happen if he weren't totally committed. No back-up plan. I wouldn't have done it but Mike's confidence paid off. It worked for him. I think Dave Roman's advice is very good. Give something a fair shot and, if it doesn't work, change it up. Maybe instead of novels you should write short stories. Maybe instead of Superman you should draw Bugs Bunny (or create your own characters!). It's so easy to get fixated on one genre, style or medium--one thing--that you don't notice another related thing right next door that could be perfect for you. As I've written before, I look for external evidence of progress. Not from your mother or spouse. At first, probably no one will respond to your work at all. Then maybe you'll get a nice note from a stranger. Then maybe some encouragement from a pro. Then maybe an editor will invite you to send some material. You sell a little thing to a little client, then parlay that into selling a bigger thing to a bigger client. Look for signs of advancing toward a goal rather than running in place. That was my philosophy even before I saw the following commencement address by writer Neil Gaiman. I think it's worth 20 minutes to watch but if you don't I'll sum up: Gaiman compares a career in the arts to climbing a mountain, and advises graduates to weigh choices based on whether they'll move them closer to the summit. If you're stuck on a ledge or skittering backwards on slippery gravel, it may be time to seek another route. And maybe--after some amount of time and effort only you can define--choose a different mountain, unashamed for having tried.